President John Magufuli said that TABD should purchase cashew nuts from farmers. 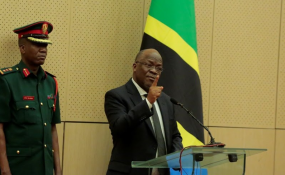 TANZANIA Building Agency (TBA) officials yesterday felt the wrath of President John Magufuli after he abrogated the right granted in 2016 to the agency to construct residential houses for Ukonga Prison warders due to poor performance. Now, the task will be undertaken by Tanzania People's Defence Forces (TPDF). The President issued his executive order yesterday when he made an impromptu visit to the construction site in Dar es Salaam, where he witnessed poor implementation of the project. The President's decision was prompted by TBA's failure to timely perform the job despite pocketing 10bn/-. He thus directed project supervisors from both TBA and Tanzania Prisons Service (TPS) to vacate the construction site immediately to pave the way for TPDF takeover. "I don't want to see any person from TBA and TPS coming to this site any more. Let TPDF do the job and once it is completed, I will hand over the houses to TPS. Let it be clear that TBA officials are not allowed to come here again with effect from today," President Magufuli insisted. The implementation of the project by TBA started over two years ago with close supervision from TPS. However, the President expressed his dissatisfaction due to its low pace, asking TBA and TPS to change the way they discharge their duties. "I want TPS to discharge duties with professionalism. It is shameful for another institution to construct the houses for you," the President told TPS officials. President Magufuli directed TBA to give a report on how 10bn/- allocated to the project was spent, warning that stern measures would be taken if there was proof of any misuse of the funds. The project, which involves the construction of 12 buildings, started in December 2016, but to date its implementation has reached 45 per cent only. The head of administration from National Service, Col Charles Mbuge promised the President that the project would be completed in 75 days with effect from today as the job would be done for 24 hours. In another development, President Magufuli made an impromptu visit to Magomeni, Kinondoni Municipal Council, where he inspected the ongoing construction of residential houses. Despite the project kicking off in April 2017 its implementation has reached 36 per cent. The President also expressed his dissatisfaction with the implementation of the project. He promised to take action. Meanwhile, President Magufuli met Ugandan President's special envoy Sam Kutesa, who is also Minister for Foreign Affairs. Speaking after his meeting with President Magufuli, Mr Kutesa said he had handed a letter to his host from Ugandan President Yoweri Museveni. He added that apart from the letter, the two discussed various issues related to good relationship between Tanzania and Uganda.